Today I have my First Guest Post to share with you guys. A while back, Emily over at Embellished Nails said she needed some bloggers to make guest posts on her blog because she would be going on a vacation. When I saw it, I immediately was interested, so I decided to challenge myself and make something really pretty for her blog. A tutorial I watched on Youtube, and Valentine's day inspired my post for her blog. Please head on over to Emily's Blog to read my post and leave a comment if you like what you see. 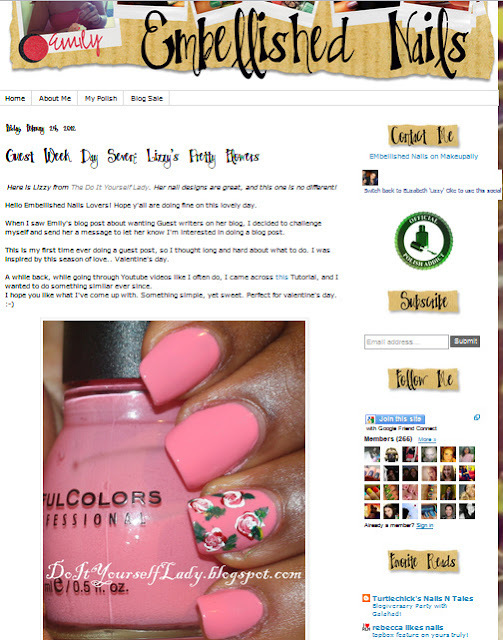 Also, feel free to follow Emily's Blog because she's a great blogger who also enjoys sharing her love for nail polishes. I hope you enjoyed my First Guest post. Wow! These look so pretty. Perfect for spring. Love it.